In a grainy video carrying the title “Collateral Murder,” shot in 2007 from a U.S. army helicopter flying above Baghdad and released by Wikileaks in 2010, many of us saw the violent reality of the war in Iraq for the first time. Until that point, the public here in Canada, as in the United States, mostly watched the war from much higher vantage point, shown an electrifying light show of ‘pinprick’ strikes while cable news anchors chattered effusively about the technological prowess of the U.S. military. A Reuters reporter and his driver were among those killed in this single incident, presumably one of many that went unreported as the war ground on. It’s as if the speaker didn’t realize that it was the invading armies, mainly those of the U.S. and U.K., who brought the ‘battle’ to the country, not the ordinary citizens caught in the crossfire on streets they had safely driven and walked along their entire lives. What this video revealed, horrifying as it was, would have been enough to place Chelsea Manning, then an intelligence analyst serving in the U.S. military, among a very select group of heroic U.S. whistle-blowers who preceded her, but the hundreds of thousands of documents related to the wars in Iraq and Afghanistan and a separate trove of diplomatic ones that came along with it had more of an impact over time, with the latter documents even helping to spur on what became known as the Arab Spring by revealing the corruption of authoritarian governments like that of Ben Ali in Tunisia. After being betrayed by an online acquaintance who she had confessed to, Manning was charged under the Espionage Act and court-martialed by the military. In the end, she was sentenced to 35 years in prison. She served seven years before her sentence was commuted by former president Barack Obama at the beginning of 2017. It has been reported, although prison officials refuse to give out any information in regards to Manning’s status, that she was removed from what is called ‘administrative segregation’ (formerly known as solitary confinement) after 28 days. Isolating prisoners in this way, which was done for different reasons to the former U.S. Army intelligence analyst for more than a year and a half of her previous time spent in military prison for the initial leaks, is recognized as a form of torture under international law. One of the most disturbing aspects of the story so far is that Manning has so few defenders in the mainstream media when she has once again made a large sacrifice on the basis of a principle that is fundamental to the functioning of a free press. The continued persecution of Chelsea Manning is also part of another story that began when Wikileaks first published the leaks she provided them. The grand jury Manning refused to testify before has been building a case against Wikileaks founder Julian Assange, who was expelled from the Ecuadorian Embassy in London where he has been living since 2012 on Thursday, forcibly removed from the building by Metropolitan police. The publisher’s relationship with the government of Ecuador and its president, Lenin Moreno, has been, to put it mildly, strained for several years, with Assange losing access to the internet in late March 2018, as part of an escalating series of actions on the part of that government leading up to his expulsion. One of the main reasons given for this earlier action was the headache he caused Ecuadorian authorities by forcefully weighing in on the independence referendum in Catalona, an obvious problem for the country’s close ally Spain. Wikileaks claims since last week that Assange would be expelled from the embassy in “hours or days” were proven correct a week later. It now appears likely, perhaps after serving up to a year for skipping bail in the U.K., Assange will be extradited to the U.S. where, though he is an Australian citizen, he could face at least five years in prison. Interestingly, the National Post went on to explain that the 7 page indictment doesn’t contain any proof that the such an effort, if it actually happened, succeeded. 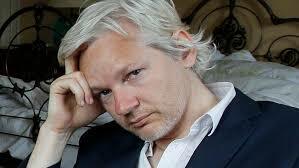 While Assange, whose beard has gone white and who looked frail as he was carried out of the embassy, is not always the most likeable of protagonists, he and Wikileaks have earned the ire of authorities less for putting intelligence assets at risk as for exposing their corruption and incompetence. The outlet actually has a record for accuracy that many mainstream news organizations should envy. The use of conspiracy charges in the indictment seems designed to ensure that Assange will receive little sympathy from colleagues in the press, some of whom might object if he were to be charged for protected work as a journalist or publisher rather than crossing an obvious legal line by helping his source commit a crime. While a protracted legal battle seems likely, it probably won’t be too long before Assange joins Chelsea Manning in an American prison, a warning to future whistle-blowers (and alternative media outlets that might publish their leaks) that those who embarrass the powerful will face severe consequences, no matter how long it takes.